19-inch wide rack-mount chassis with redundant AC/DC power supplies. Configurable input/output modules support all serial, voice/fax, Ethernet and G.703 DTE interfaces. The NetLink rack system can expand to 320 modems in a standard 40U-high rack system. When users require higher density solutions, a rack system becomes more economical. The NetLink Model 1001 rack system consists of a 2U-high chassis that can be mounted in any standard 19-inch wide telco rack. The Model 1001 chassis supports up to 16 modem modules and a single AC or DC power supply, or dual-redundant AC or DC power supplies. The rack shown above is a fully-configured NetLink Model 1001 rack system containing 13 modems, a network management module, and two power supply modules that fill the 18 front rack slots. Equipment/network interface modules that fill the rear slots of the rack chassis connect to the front modules through a midplane bus that extends the width of the rack. 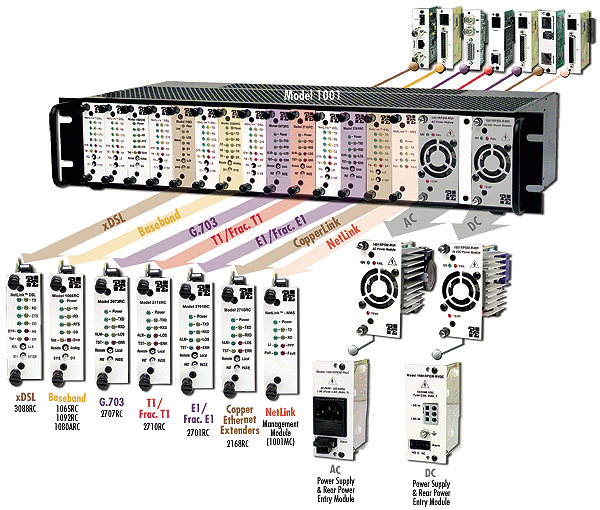 Nearly all of the electrical and physical interfaces, from Ethernet to V.35, are available as I/O modules. Dual redundant AC or DC power supplies can be installed in the rack system to help avoid catastrophic failures caused by power fluctuations or outages. The NetLink rack system enables users to configure, control, and perform diagnostics via SNMP or HTTP. To manage a rack system, the operator need only install a NetLink Management Module (Model 1001MC), connect a workstation to its Ethernet port, and launch a standard Web browser (i.e., Netscape Navigator or Internet Explorer). Now, any operator can manage any NetLink rack card or standalone modems from a local PC or via the Internet. The Model 1001 rack system can have one or two 90, 264, VAC or -12/-24/-48 VDC power supplies installed in any combination. Each power supply can support a fully-loaded rack configured with any combination of front modem modules and rear I/O cards. If two power supplies are installed, they automatically self-configure for dual-redundant, load-sharing operation. In dual-redundant configuration, each power supply shares 50% of the load. In the unlikely event of a supply failure, the other supply immediately begins providing 100% of required power; the operator is notified by an audible alarm; an LED flashes on the front panel; and the central site operator is notified via the network management system. The NetLink rack system's midplane bus connects front modem modules and rear I/O modules, delivering the right combination of modem technology and interface support. Physical/electrical interface conversion is also built-in to the system architecture. For example rack cards with G.703/G.704 interfaces will connect to V.35/X.21/EN standalone units.